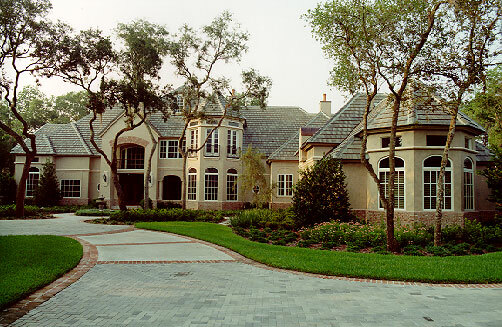 Featuring dramatic interior living spaces, this palatial 8,170-square foot Country French residence located in Orlando, Florida, is exceptionally suited to the social lifestyle of its executive owner, yet it also retains a casual elegance that makes the whole family feel "at home." The approach to this home is picturesque, reminiscent of French Country Architecture. It is composed of brick, stucco, cast stone, and heavy timber - earthy but well-crafted materials which provide an ambiance of warnth and timelessness. The living and entertaining rooms as well as outdoor areas are interconnected and intimately scaled to comfortably accommodate a party of 4 to 400. Guests have the options of sitting around the piano, having drinks at the bar, gathering near the fire, playing billiards upstairs, dining formally or outdoors near the pool, or lounging on the balcony. Level changes and overlooks create drama and interest. A central corridor is the primary ordering element. The corridor offers a sequence of events as one passes from the entry stair with its dramatic view through the living room, to an intimate wine cellar, past a two-sided masonry fireplace which opens to and is on axis with the formal dining room, and into the more casual family areas. All of the bedrooms and major living areas overlook the lakefront through a fringe of cypress trees. The Master Suite is given the most elevated and central location above the living room, which has a ceiling height of 15 feet. Its French windows open off the major bay, affording a spectacular view of the pristine water and conservation area. From the massing and spatial relationships to the intricacy of its details, this is a home which is harmonious, gratifying, and a delight to the senses.